I've had many requests to learn more about my Ezio Venetian Assassin Mask, so when I last made it I took some photos of my process. There's already a video of my basic mask process on YouTube if you'd like to watch instead of read. first laid eyes on it. 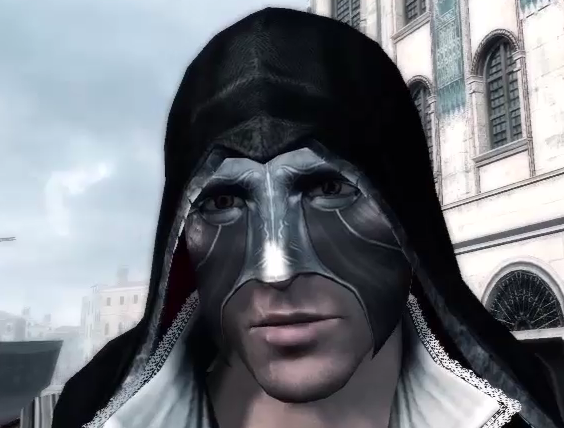 This mask presents a problem, however, because most of the forehead is obscured, as are the fine details because of the pixelated nature of the game's graphics. That's when I whipped out some good ol' fashioned imagination and made up the rest. My version of this mask comes up to the hairline with swirly accents along the middle of the forehead and brows. I had to make sure that a hood or a hat would fit comfortably atop the mask, thus the reason it ends at the hairline. My head's name is Pat. Next, I take measurements from the ear to the outer corner of the eye, the inner corner of the left eye to the inner corner of the right eye, and from the hairline to the tip of the nose. With the way this mask comes in so close to the eyes and stops at the hairline and nose, measurements are needed to make sure it lays right on the face. Normally, I use a generic male styrofoam fashion head I bought at Hobby Lobby as a base to form the mask on, as the breadth of the face is wider than my own, which would be too small for most males. If you don't have a Hobby Lobby closeby, most fashion stores (like Sally's) will have styrofoam wig heads. Finally, I print out my design in blue ink so that when I'm tracing over lines with a ballpoint pen, it shows my progress by blacking out the lines as I go. Before transferring, dampen the leather with a wet sponge so that the lines will be impressed into the surface. They sell special transfer paper at Tandy, but using plain printer paper with the pattern printed in inkjet ink has always worked fine for me. If you mess up your lines while transferring, you can always rub or sand the mistakes out later. 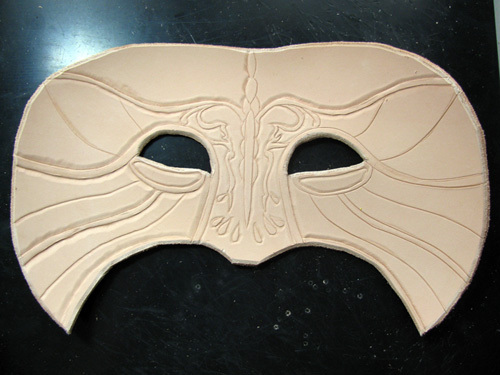 You can see in the photo that I've already started pressing in the lines with my beveler stamp and modeling spoon on the right side of the mask (left side of the photo). The main lines have been cut into the surface using a swivel knife. The process of adding dimension to your leather by creating depressions with stamps and tools is called tooling. Tooling is a subtractive process, meaning you do not add things to the surface, but rather cut away or emboss the lines, so you have to think in the negative. If you want an affordable swivel knife plus some basic stamps, I recommend grabbing this starter kit from Hobby Lobby using their weekly coupons.